Everyone knows that hiring a Toronto Plumber does not come cheap. Whether he or she is with you 5 hours or just a few minutes, time means money when it comes to the plumbing world. This is partly one of the reasons why many people prefer to troubleshoot certain plumbing issues to see what can be done until they have exhausted all possible options. On the list of DIY plumbing is the need to know the basics about how to fix a gas or electric water heater. 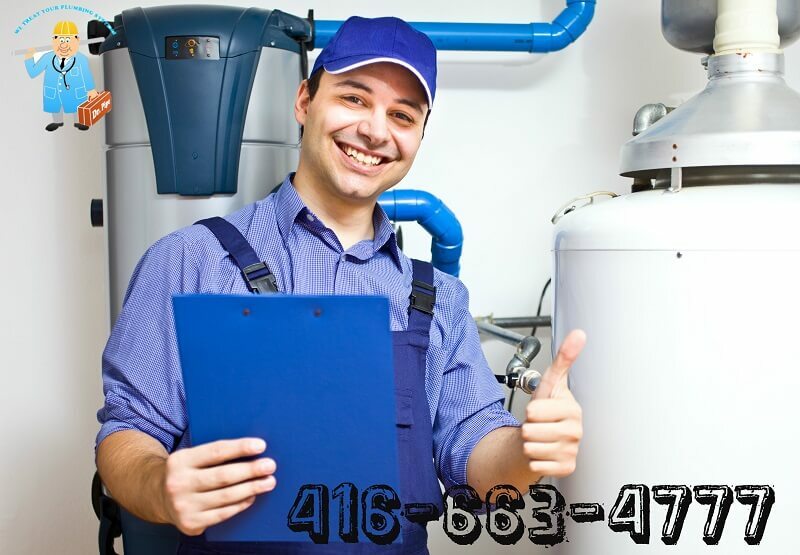 People who do not wish to go back to the primitive days not even for a few seconds will find the tips below very usual on cold days when getting hold of a Toronto plumber can be a frustrating experience. An electric water heater should NEVER be looked on as something that can be regarded as a ”piece of cake” when it comes to fixing. The risk of being electrocuted to death is quite high if certain precautions are not taken before looking at common problematic areas that many people call a Toronto plumber to fix. If you do not know anything about your electric heater then take then time to read the manual that was sent with it from the manufacturer. If you cannot get a hold of the manual and know absolutely nothing about electricity, gadgets, wires, different controls, multimeter, then DO NOT attempt to fix it by your self. Paying the extra cash to get a professional Toronto plumber to look at it is worth not being electrocuted to death in the event of an accident. The guidelines below are for people who have basic or in-depth knowledge about water heaters and not for those who know nothing. Of all the problems that are listed above this is the most common issue that people tend to have with their electric water heater. The lack of water or no hot water are indications that either the heating system is with defect of there is a problem with the thermostats. Damage to the thermostats can impede power from getting to the heating system, and as such one should check the heating system to see if power is getting there. If there is no power then this means that the thermostats is damaged.. If there is power but the water is not being heated, then this means that the problem is with the heating system and not the thermostat. One of the ways of checking the thermostat to see if it is working is by turning it on and off to observe its reaction in both situations. If the water that is leaving the electric heater is not hot enough then once again either the thermostat or the heating system is having some problems. It is important to check to see that current is actually getting to the thermostats and that the problem is not something outside of the electric water heater first. Once this is done then check the upper heating system to see if it is working. If it is working, but the lower heating system seems to have problems then the problem is with the thermostat and not the heating system. Changing the thermostats should be enough to remedy the situation. Look to see how the indication for temperature change has been made on the thermostat. In some cases it is A, B,C in other cases it is hot, cold, moderate ,etc. Turn it in either direction to see what happens. If turning it to hot does not make the water hotter or cold colder then as pointed out above there is a problem with the thermostat. You will need to multimeter placed in the proper voltage to test the upper and lower thermostats. If the multimeter indicates any problems in any of them then get a thermostat from your hardware store that is the same size and rating. Read the manufacturer’s instruction carefully to see how you will need to install it. Before you start to check the heating system make sure you have done steps one and two above. With those in place proceed to carry out checks using a multimeter to test the heating elements. If it shows that you will have to replace the elements then this can only be done by draining the heater. The element should only be replaced with one of the same size and rating. If there is a problem with the heating element gasket then you will notice leaks from time to time. The only solution to get around this without calling a plumber in Toronto would be to change the gasket. All power to the water heater should be turned OFF before you attempt to do this. Once the electrical power is off then turn off the water supply that will get to the water heater as well. You will need to remove all the water that is in the tank by draining it from the water heater. Only after doing all these steps will it be possible to change the gasket. One important thing to bear in mind before turning the power back on on your water heater is to ensure you turn the water supply back on. Some people that do not want to hire a plumber forget this important part and end up losing their electric water heater due to forgetting this. It will also be necessary to release any air that is in the water tank before actually starting to use the heater. Leakage can also be caused by water pipes that are connected to the water heater. At times just tightening the fitting on these pipes is enough to dispense the use of a Toronto plumber. When the fitting has suffered extensive damage then tightening it may not be useful. In this case you will need to replace it with a new one. Corrosion is another reason why water heaters begin to leak. If you find that nothing you do has proven to be successful then chances are your water heater is badly corroded and will have to be replaced. You will notice this by the smell and color of the water that is coming out of it. You will not need to call a Toronto plumber to tell you that your water heater is corroded if you observe these signs, but you may need to call one to install the new one you intend to buy. When the anode rod has suffered a great amount of corrosion then you will notice that a certain smell will come from the water that your electric water heater releases. The build up of bacteria inside your tank is also another plausible reason why the water that leaves your electric heater is having a horrible smell. The solution for these two solutions that most plumber will charge a arm and a leg to do are: change the anode rod if it is badly corroded and clean the tank with a solution that is effective against bacteria build up. Some plumbers generally use a diluted solution of hydrogen peroxide, so check your hardware store to see if they have it or if they can recommend something else. If there s a build up of certain elements in the heating elements then this will produce a noisy effect in the electric heater. Some people enter into panic and assume that there electrical heater is getting ready to explode and call a plumber in Toronto to have a look at it. However, just simply cleaning the heating elements ( both upper and lower ones) is enough to remedy the problem. If you find that after doing this or that removing the elements is difficult, then do not try to force them off. You will need to consult a plumber to see what can be done. Disclaimer.The information that is contained in this article is solely to be used as a guide and was not written with the intention of replacing professional guidance. All the information that is contained within is deemed accurate to the best of our knowledge and this website along with its owners will not be held liable for any losses or damages suffered while performing any of the steps outlined above.